I won't know if I won for a few days, but it's exciting to just to be nominated. I think someone upstairs is watching over me and my novel. 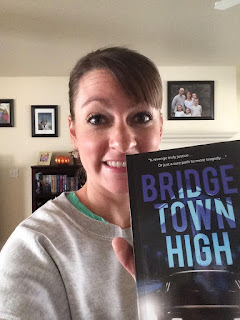 For many of you who are new to my ramblings, I've found a lot of people on Facebook who are from the towns and area, including John Swett High, where my novel is set. I welcome you, and everyone else I've "Friended" over the past few weeks and months. It's so nice to connect with all of you. I hope you will post your email on the side-bar so you won't miss all the excitement I'm sharing as I go through the writing, querying, publishing, and marketing struggles. It's really been a "trip," as Gary, one of the main characters in my novel Bridgetown High, would say. Since I mentioned him, maybe I'll to ahead and introduce him to you. Gary Johnson is Mark Wilkerson's brother. Mark it the main character in the book. Gary is a bit unconventional -- a hippy if you will. I love his speech patterns, but his use of the word "like" in a lot of his sentences does get a bit tiring. But. that's Gary. He has a mind of his own and is extremely loyal to Mark, even if they do have their differences at times. In addition to being a hippy, he is also a member of Students for a Democratic Society (SDS). You can look that up in your Funk & Wagnall. Near the beginning of the story, Gary is asked to the "Vice-Versa" dance by a nerdy girl named Kathy Kelly (unique, I know). Thus starts a platonic love affair that just keeps going throughout the story. I won't tell you any more. Sorry. You'll just have to meet Gary for yourself as you read Bridgetown High. But, I will say this, he plays an integral role in the climax of the story. If you don't already have a copy of my novel, get one. Each of the characters has their own story. You won't be disappointed. Go to here http://www.amazon.com/dp/1680583093/ref=cm_sw_su_dp to read the reviews. Also, don't forget to "Share" and "Like" this post. Thanks. The more everyone does that, the more people will get excited and want to read my book. Hi, to all my faithful friends and followers. I hope you all had a wonderful Martin Luther King holiday. Mine was busy, but great with the advent of our 14th grandchild. I also received a new review at Amazon -- number 9. The person gave me a rating of 5 out of 5 and boosted my overall rating to 4.8 out of 5 -- thank you very much, reviewer. Not bad for a not-so-best selling novel. But then again, I have no idea how well it's selling, or not, and won't know until the end of March. Have you been to my Amazon site and checked out the reviews, or even better wrote one? I've learned that the more reviews a writer gets, the higher the novel's rank at Amazon can go, and Amazon will put it higher on the best-selling list to capture more purchases. It also helps to get tons of "Likes" and "Shares." If I could get everyone reading this blog posting to click on the "Share" button on my Facebook pages, that would increase my marketing reach a lot as all of you have different "Friends" lists and posting to the "Public," would go to all your friends as well as mine. Now, I just need to find more time to write. Ever since I sold Bridgetown High, I haven't had a free minute to write. But, hang in there with me. I'll find a way somehow. Until then, you can share my frustration as a writer. Thanks for following me. More to come. A wonderful hello to all my friends and followers (which should be the same group). Today is an exciting day for me and my family. Our 14th grandson was born today. Have you had a chance to read the interview a blogger did for me? If not, here is the link on Facebook: https://www.facebook.com/search/top/?q=fiona%20interview. I'll let this be my blog entry for the next few days as I need to spend time with my wife and children and grandchildren. Until then, have a wonderful time and remember the advice readers and writers are told: read, read, read. Hi, all my followers and friends. I just got an email from one of the many book promotion sites, "Bublish." They are offering a free month of advertising for my novel if I "write a blog post about Bublish on your website, and share it socially with your network of followers." "You BLAB (Blog About Bublish), and we give you a free month. It’s simple!" Sounds easy. So, here it is. Blublish seems to be a great help to published and indi published authors. I've used them some and when I checked the results I could see a spike in the number of people who expressed interest in Bridgetown High, and for the first month Bublish's service was totally free. If you are a writer, ready to be published, Bublish might be a great way to go. A wonderful New Year to all my friends, fans, and followers. Despite the stock market crashing, I think 2016 is going to be a wonderful year. In another week, if all goes well, we will welcome our 14th grandchild into this world -- another boy. We are excited to see this little one and pray he is healthy and normal. That's been my prayer for all of my grandchildren. I still have no idea how well, or not, my novel is selling. I think the Blog Tour my publisher did for me, has helped, but I have no idea of how much. Yesterday, a lady I've never met before asked me if I would let her interview me (via email) for her blog site. I can't see how that could hurt anything as long as the questions aren't too personal. So, during my lunch break I took a stab at her questions. Pretty much, they're just questions about my writing. I told her I would be willing to return the favor, but she said she's not a writer, just a blogger, and wants some material for her blog. I guess that's OK.
Just wondering. How many of you would like to learn what I had to learn about writing fiction? I'm willing to do that if there's interest. She stood five-foot-eleven, had to be all of 450 pounds and smelled worse than a sewer. Her dull beady eyes looked out from a mass of tangled, dishwater blonde hair. Her twisted and puffy face was pocked with oozing acne. “IT’S GERTA! RUN FOR YOUR LIVES!” We’d all scream in our best blood-curdling cries whenever we saw her. Everyone knew she was cooties of the deadliest kind and we would probably die if she ever touched us. But I loved her. Does that peak your interest? Now, I just need to fashion a story around that theme. When I do, I hope you'll all hang in with me as I express the struggles I will have writing that novel. So, until next time, I wish you all a wonderful beginning to the New Year, and don't let the stock market scare you. It'll pop back up in a few weeks.